1. Chilliwack Airport, November 15, 2005 - The Calm Before the Storm. The last cryptic remark - Eagles X2 - implies that all did not go according to plan. 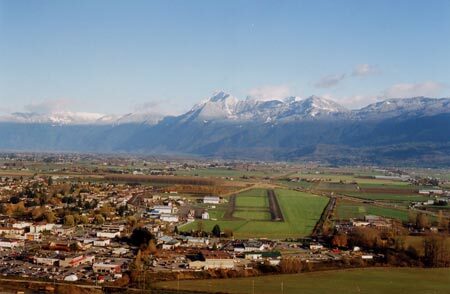 After several circuits at Chilliwack I climbed west towards Pitt Meadows. In cruise attitude at 2500 feet ASL just east of Hatzic Lake, my scan picked up an oblong object at 10 o’clock and two-thirds up the windscreen. Head movement ruled out insect debris. Lack of relative motion and gradual size enlargement reeked of collision threat. Seconds ticked by. A sense of unease pervaded the cockpit. Still identification was elusive - aircraft or helicopter? Then I detected a fluttering along the upper wing surfaces - feathers! Immediate right descending turn. The unidentified object blossomed into a mature bald eagle in attack posture - wings stalled, talons extended, unblinking eyes, as it flashed just overhead. Glancing up I observed the mate soaring gracefully, oblivious to the pandemonium below. After regaining my composure and control of the aircraft, I continued en route to Pitt mulling over this encounter. It occurred to me that this interception was not accidental and had been in progress for some time before I was aware. My time estimate from first sighting to evasive maneuver was 4-5 seconds. I shudder to think of the outcome if my head was buried in my Canadian Flight Supplement confirming the A.T.F. for Fort Langley. Trajectory would have been above the propeller arc and impact at head level - akin to a 20 mm cannon shell in plumage. I was left with the uneasy inclination that I had been the intended prey. I put this incident out of my mind until I was informed of a similar encounter in the course of an aviation medical examination.